During the War of 1812, the lawyer and amateur poet Francis Scott Key wrote a poem about the events of the attack at Fort McHenry in Baltimore, MD. This turned out to be what Americans call the National Anthem and what is considered the war cry for freedom in this country. A bold, yet, noiseless protest against the social injustice in this country received a lot of attention. The problem is that this aggressive backlash wasn’t his aim. The idea was not to shun the military of this country, but more so to bring awareness to the current unjustified acts taking place in America. The irony of the situation comes in regards to the military’s position in the pregame ritual. While all of the attention is directed to Kaepernick’s decision to remain perched during the National Anthem, one thing that has been mentioned and not always talked about is the fact that the military has to pay to do these showings. You would think it would be patriotic of the teams owners and the NFL to conduct these ceremonies for free? 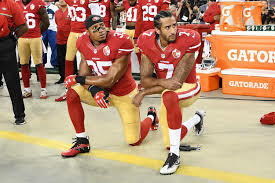 It seems unlawful in the minds of the professional sports leagues to let this continue despite their service to this country. Take time to ask a few veterans that are behind #VeteransForKaepernick. With the increase of popularity of this hashtag, many have spoken about how they have been treated post war and how they feel currently. Before people critique Kaepernick, they should take a closer look in the mirror. It seems as if he is only exercising the right that America originally fought for: the right to freely express their grievances. For the people who think this was an attack on the military, think about the actual problem that he is trying to present to this nation. Kaepernick won’t change the world with this statement but he has made it an uncomfortable situation that is and will continue to be talked about on a national stage.